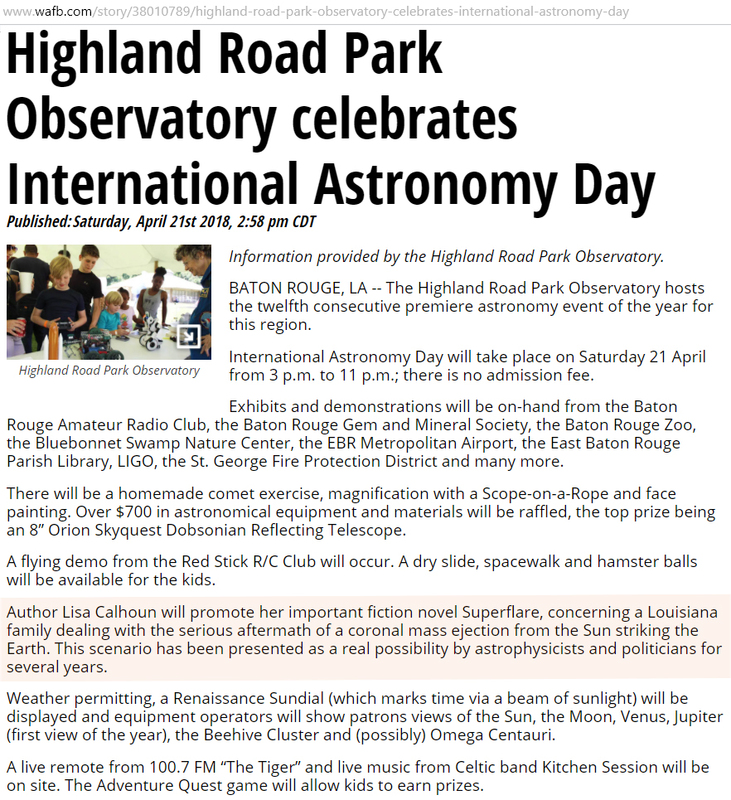 BREC's Highland Road Park Observatory celebrated International Astronomy Day on April 21, 2018. That day WAFB TV posted a story about it on their website. I've highlighted the paragraph where they spoke about me and Superflare: The Fortunate Ones taking part in the function. 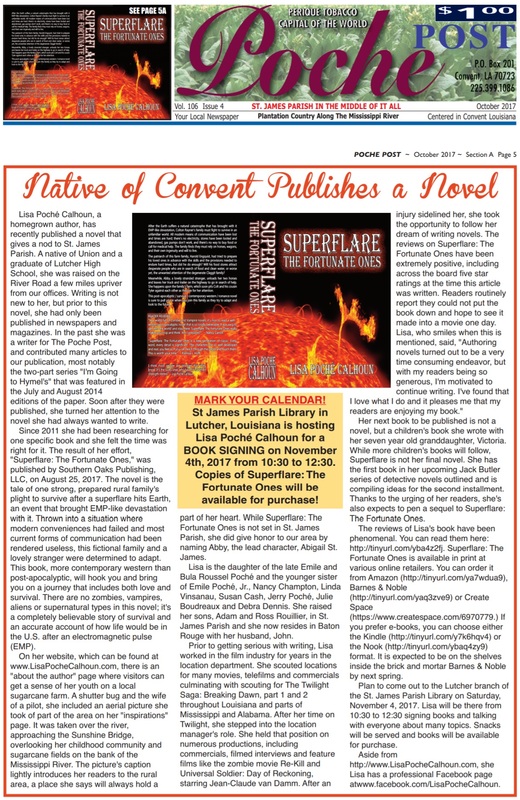 I have to say, I truly like this write up that is on the Observatory's website about Superflare: The Fortunate Ones. It's quite accurate. Many books left with readers during the even and it proved quite popular with young adults, too. Survival fiction has a lot of interest. 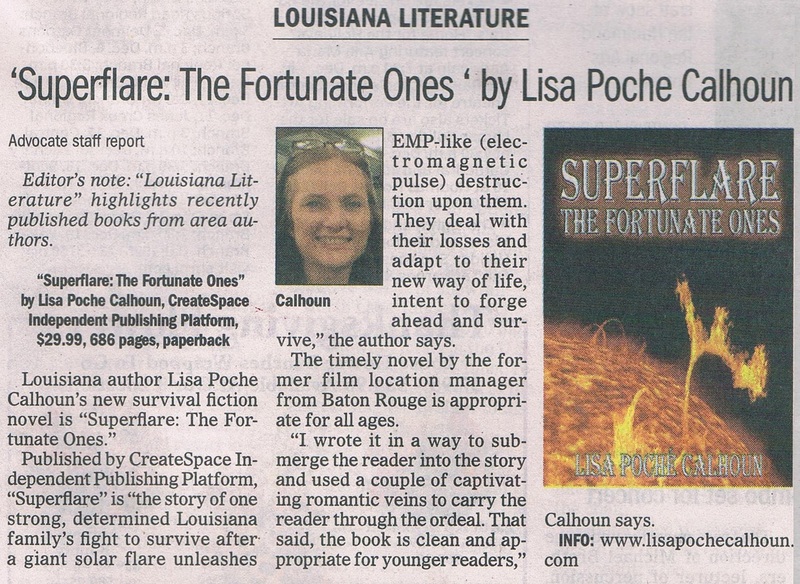 The Advocate daily news paper serving the city of Baton Rouge and the surrounding parishes highlighted my novel Superflare: The Fortunate Ones in their "Louisiana Literature" feature on the Sunday paper. What an honor! 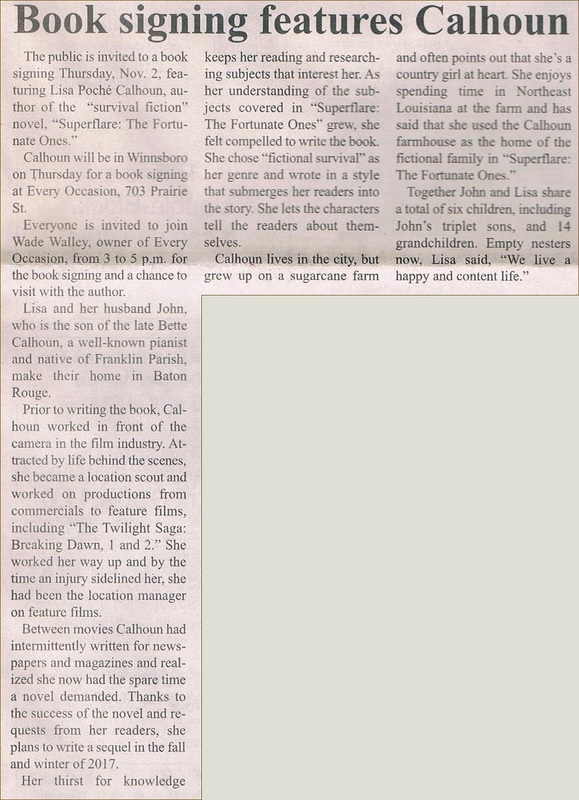 This article about me and Superflare: The Fortunate Ones appeared in News Examiner in my home parish (county) of St. James. It was an honor. One note, though, you'll see where the writer calls me Julie. She knows one of my sisters, Julie, and inadvertently used her name instead of mine. It's a good article and my sister and I were humored by the error. 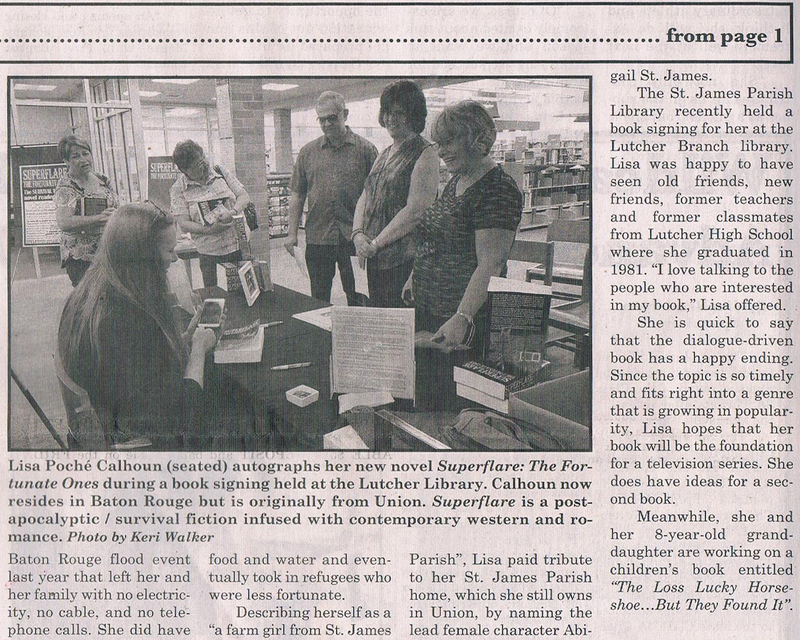 This is an article that ran in the Franklin Parish Sun prior to a Superflare: The Fortunate Ones book signing I had there. It was set up by the Franklin Parish Library at a neighboring shop. This is an advertisement that the owner of the store where I had the book signing took out. His store is located across the street from the library and he handles all of their book signings. 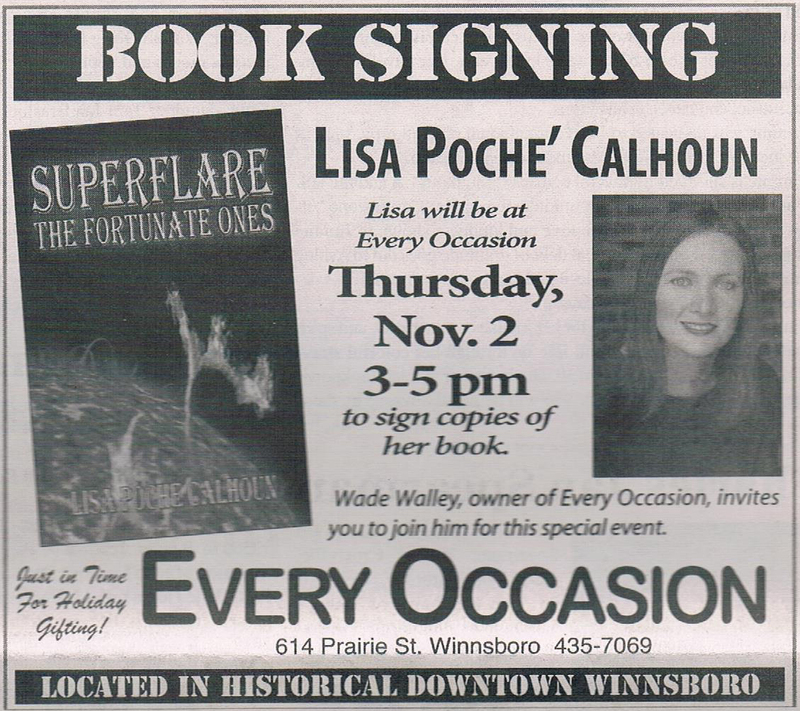 The Poche Post is one of the local newspapers in St. James Parish, where I grew up. It's named after a plantation that the paper's publisher owns, but is neither owned nor run by any of my relatives.